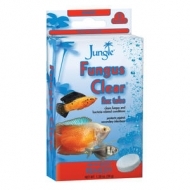 SulfaPlex™ is an effective and safe treatment for many bacterial, fungal and protozoan infestations in the aquarium. Easily removed with carbon and does not impair nitrification. KanaPlex™ is a blended kanamycin based medication that safely and effectively treats several fungal, and bacterial fish diseases (dropsy, popeye, fin/tail rot, septicemica). PolyGuard™ is the single most effective medication to keep freshwater fish free of disease! Focus™ is an antibacterial polymer for internal infections of fish. NeoPlex™ is a broad spectrum antibiotic effective against most external infections of both marine and freshwater fish. Quickly clears ick and protects against secondary infections. No need to raise the water temperature. 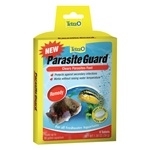 Parasite Guard removes external and internal parasites from tropical fish including flukes, internal worms, lice, anchor worms, and flagellates such as hexamita or spironucleus associated with hole-in-the-head disesase. Also protects against secondary infections. 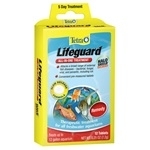 With Tetra's Lifeguard, there is no need for time-consuming guesswork when it comes to treating your freshwater fish. MetroPlex™ is an effective and safe treatment for several protozoan and anaerobic bacterial diseases of fish (Cryptocaryon, Hexamita, Ichthyophthirius). It does not adversely affect the filter bed and is easily removed with carbon. There is little danger of overdosing. Usual dose is 125 mg/10 gallons. The only fish and filter safe aldehyde based (10% by weight) parasite control product available. Unlike highly toxic and difficult to use formalin based medications, ParaGuard™ contains no formaldehyde or methanol and will not alter pH.